In this original series, Globetrotter discovers the rising musical prodigies of Southeast Asia who are more than ready to give you the Variations in Sound! For Part 5, we talk to Philippine’s Arvin Nogueras, also known as Caliph8. Visit the Part 5 in the series, where we talk to Singapore’s Fauxe. An artist is naturally curious. They feed their creative soul by countless attempting different techniques for their art. Always strive to develop new methods or ideas. Call it overly ambitious, it is what they live for. No boundaries nor restrictions. 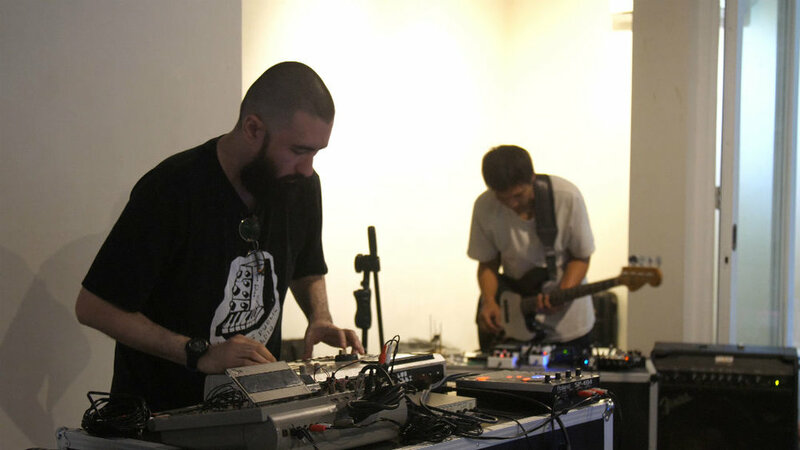 Arvin Nogueras, who goes by the name Caliph8, is a sound and visual artist, graphic designer, creator of sound installations and hip-hop enthusiast. During his time as an art school student in the ‘90s, Arvin found passion in making experimental hip-hop, something that was still very left-field. His youth was filled with intimate sessions of experimenting and collecting ethnic music as much as possible for sampling purposes. Though he couldn’t remember the first track he listened to, artists such as The Bomb Squad; Stock, Haussen & Walkman; Pierre Henry and Michel Colombier as well as David Axelrod made a huge impact on how he shaped his sensibilities as a sound-based artist. For the past 20 years, he has been active in Manila and overseas. More recently, he was in Yogyakarta, Indonesia for the NusaSonic, an experimental sound festival, where we met him for a one-on-one conversation. Known for his talent to deconstruct and reconstruct music, Nogueras immerses himself in learning the languages and the contexts of the samples he’s going to dissect, which makes his creative process so intriguing. Learning the language of a particular genre cannot be done in an instance. Well, no one said it would be an easy ride anyway! It took him years to understand jazz and classical new music to fully grasp the language of free jazz and improvised music. To turn a particular genre of a sample into a new meaning and ideas using deconstructed parts is important to him. The artist does not box himself in one or two particular genres. “I find genres from the ‘60s interesting. Psych Rock, Folk, Free Jazz, Early electronic, experimental and new music are some of the genres I frequently absorb”. When life can only be understood backwards, it still needs to be lived forward. He believes everything takes resilience and chooses not to compromise. The film follows the release of his latest album. StudioRama brought the two international DJs to Jakarta for the Wave of Tomorrow festival. Major Force has a huge influence on the Japanese music and street fashion scenes today. Ghanaian culture-shifter Blitz the Ambassador lays out his radical vision for artistic engagement and independent spaces by Africans, for Africans. Oh and his new album Diasporadical is out now, and it's flames. Disco classics from Salsoul Records get reworked by Sounds Familiar. Paris-based singer-songwriter Mélissa Laveux goes back to her roots to produce her most conceptual set to date, Radyo Siwèl, featuring traditional Haitian songs born or imagined in the time of the American occupation. Cameroon-born and New York-based, Vagabon lives up to her stage name via her restlessly adventurous sound, buoyed by an intriguing mix of tender voice and defiant songwriting. Indonesian pop legend Anggun is back with a bang with her latest oeuvre, 8: a sign of coming full circle and looking ahead of the curve. East London singer-songwriter Hak Baker provides cutting contemplation on the modern British life through the lens of an emotional and jaded outsider.